...but most of all, surround yourself with those who see the greatness within you, even when you don’t see it yourself. Edmund Lee. Two weeks ago, I probably made a life changing decision. I forced myself to sign up for the gym. You are right, I also thought that hell would freeze or chocolate would be calory neutral before that would ever ever happen. And still, I went there, told the guy that I actually do not want to be there but that I have to. And so it started. Since then, I kept a real positive attitude towards going to the gym. As I am working towards fourth level, I feel the urge to do more, to support Hafl in whatever movement. I need to lose weight, I need to grow stronger. My core needs to be stronger to keep my hands softer, the excess pounds need to go. I could run, I could ride my bike. Honestly, I only ride my bike when I do some breakfast grocery shopping on Sundays. And it is not too late. Or too early. And it is not too hot, but also not too cold. And I need to feel like going. Actually, it happened only THREE times this year so far. Nothing solid to build my fitness on I guess. I tried running. Once. Ok, twice in the last two years. Last year, with barn mates. Once. And this year, alone. I saw people looking at me and I felt that they felt sorry. Actually, I did not only run, I walked and run. I walked more than I run. So what to do? Doing more yoga and stretching at home did work to a certain extent. But then I felt alone in my struggle to increase fitness, lose weight and become a better rider. The only choice and thing left was the gym. Actually, I probably would have kept emphasizing that I needed to do more without doing anything then. One day a fortnight ago, my trainer said that she went to the osteopath and she told her to go back to yoga. And that is why she sign up for the gym. At this specific one, which is actually in the same village as our barn, you can do also courses like pilates and yoga. What's more, there are always trainers around that (if you want to or if they feel that you would a) simply kill yourself or b) never come back) help you. The good thing is, that there is a certain circle training which consists of strength and cardio training. All the weights and resistances are stored on a little personal chip card meaning you do not have to adjust anything just put in the card and go. And the trainers set up your training plan. I guess that helped me to get things started. This week, we will start split training where I will, in addition to the circle training, start with specific core training. My trainer obviously believes in me. Last year, when I decided to move Hafl to my trainer's barn, was one of those crucial decisions that would change our future forever. While I was more or less at second level (sometimes more less than more more), we are now on a good way to a proper third and one day, fourth level. Sure, the chip card at the gym and the good hay at the barn help a lot. But what is way more important is that I started to surround myself with the right people. People I can learn from, people who have goals, who are motivated, people who do. Of course, I was boarding at a barn where there were riders who showed before as well but most of them were eventers. Some of them were serious about riding, some were less serious. Some were happy with the level they were at, some strived for the next levels. Today, I have aspiring Grand Prix riders around me, people who show regularly, people who win, who work hard in their daily business to afford this expensive hobby. They do whatever it takes to keep their horses healthy, they work together with vets, farriers, therapists to have happy athletes being able to perform at their best. They changed how I work with Hafl, even Hafl changed. He became much more self-confident, he is building up muscles and strengths better than ever before. He improves and so do I. My trainer constantly keeps an eye on us, the regular training pays off. I have learned so much in the last months and I keep on learning as there is always somebody around who is at least a lever better than me. They inspire me, the lift me up, the support me. 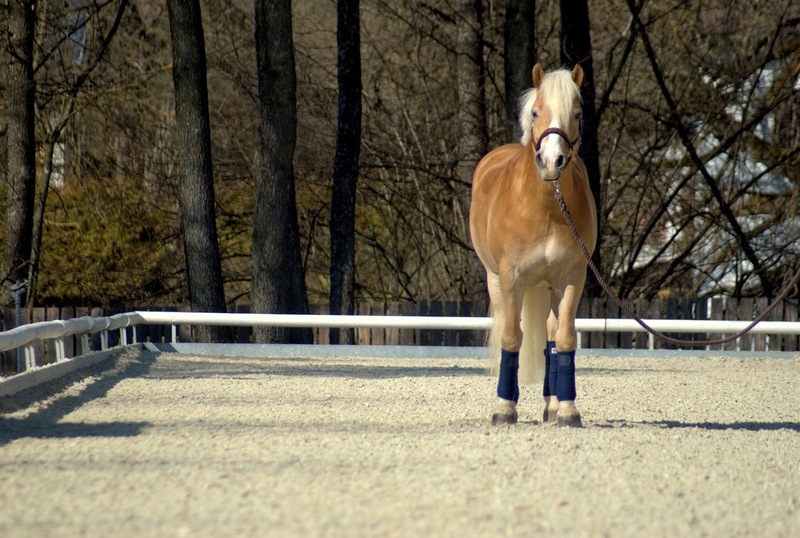 And they believe in me and share my dream of becoming a real dressage rider with me. People go to the gym for various reasons, some only want to build up huge mountains of muscles (Greetings to the boys in the back corner! ), some want to increase their fitness level, some want to lose weight. Surrounding myself with those who do not fear sweat and tears, pushes me. I am doing two circles in a row now already. Doubled my effort in only a week. And it becomes easier, I do not feel like dying anymore after the first round. I think that everyone can become the person he dreams of but with the right people around, it is way easier.